These are samples only. Please let us know if you want to see more about a specific course. An example of one of our earliest reviews. "I really enjoyed taking the Marine Weather course. I learned so much! I am much more confident about buying a boat to go further offshore. I found that buying the hard copy textbook (after starting with the all electronic version) made the last four chapters and certification review much easier." "This is the third course I have taken from you and I really appreciate the school. I like the option of dropping in and dropping out as life dictates. David, I am amazed at the breadth of your knowledge in so many facets of maritime knowledge and the amount of work you and your staff has put into all of the courses that you offer. Thank you." "I just finished the Marine Radar course. I'm very pleased with the course. Very organized and surpassed my expectations. I particularly appreciate that it was a difficult, intensive course. I like that there were different teaching methods incorporated including reading, exercises, presentations, multiple choice and written exams with feedback. The support was excellent including timely grading of quizzes and prompt feedback to questions. All in all a great class and I look forward to taking other starpath courses in the future." "Thank you again for another great course. I throughly enjoyed the Cel nav course. As with your other courses, I appreciate that it is difficult and some of the questions require a good deal of research and critical thought to determine the correct answer. I also appreciate that the quizzes are learning opportunities in themselves. CAPT Miller was always timely in reviewing quizzes, providing explanations, and answering questions. I'm looking forward to leaving the desert here in Afghanistan so I can get back to the ocean and practice using real sextant sights." "The course was great. It covered everything in a very logical and complete manner. I loved all the different forms. I was able to understand all of the concepts. I had my Captain's license from the mid-80's to the mid-90's. I taught ASA sailing courses and sailed in the Gulf of Mexico, Florida Keys, Bahamas and the Virgin Islands. I used DR and RDF's to navigate, but I always wanted to learn Celestial Navigation. I am planning to take other courses." "We completed the Marine Weather course and have really enjoyed it. Each lesson builds on the previous one, making it easier to learn. The lessons are presented in a logical format. All of the quizzes were graded quite promptly and fairly. We really appreciated all of the additional material, resources, and guidance given. This will be a huge value to us when we start our big trip south this fall. In fact, we are already using what we learned on a daily basis! Thank you so much for making this available and for all of the support." "I want to express my personal thanks to each of you who has so patiently steered me through this course. The amount of learning far exceeded my expectations I found the course material to be enlightening, challenging and rewarding. I will certainly feel competent and comfortable enough to accomplish a limited ocean sailing journey, let alone the sheer fun of doing it. I will not hesitate to recommend Celestial Navigation as a course of study from Starpath to any of my mates. Fair winds and following seas." "I found the Starpath program provided a very solid and in-depth learning experience. Having read course material on navigation from other places, I found the topics presented by Starpath more complete and supported by an abundance of helpful rationale. 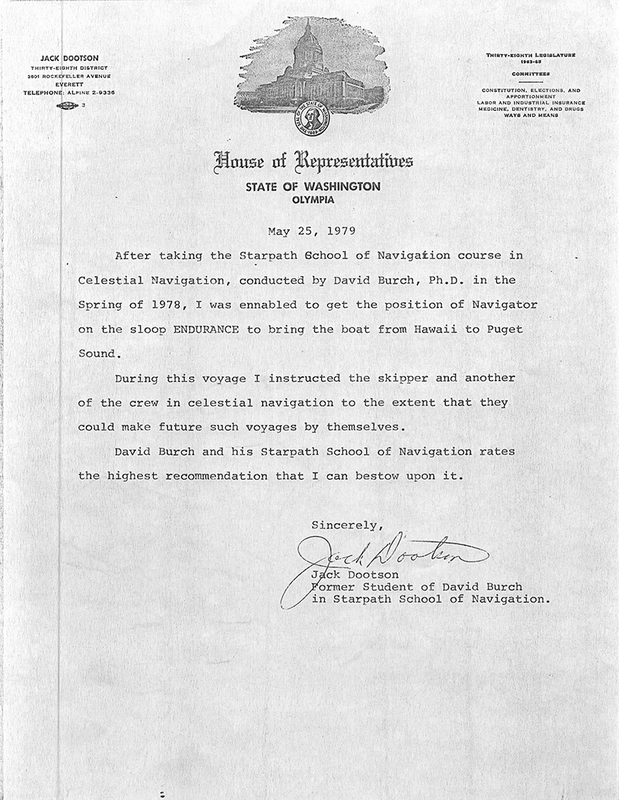 Shortly after completing the Starpath course work, I received US Sailing Coastal Navigation certification through a proctored arrangement between my local library and the OCSC school in Berkeley, CA. Thank you to David for his direct interest and desire to see that my pursuit with US Sailing came to fruition. I'm pleased to say there are even more folks over at OCSC that now know about Starpath." "Aloha, I just wanted to give a shout out in thanks for the course and website. I live in Lahaina, Maui and yesterday we had two fast moving cold fronts move through along with a large, large NW swell. The winds were Kona, from the south, which is always bad for Lahaina. Since starting the Starpath Weather course I not only understand marine weather better, but I pay much more attention to the weather which paid off yesterday. My husband and I have a 44ft sailboat moored in the Lahaina roadstead and we knew with the cold fronts, south wind and NW swell things would get rough and so we prepared. Our boat survived well with no damage, but 5 boats were lost yesterday. Three broke there moorings and 2 went down on their moorings (both within a 200 yard radius of us). No one really thought the wind and swell would cause damage and so most boat owners didn't even prepare for storm watch. It was such a clear example of how just listening to the TV news weather forcast is not enough. My husband has been sailing for 30 years and is constantly amazed at the quiz questions and level of detail being asked. Yesterday was a clear example of how useful and well put together the course is. Mahalo nui loa!" "...your books and "stuff" are spectacular. I took the Coastal Navigation course online years ago and just used your navigation book again to refresh for the ASA Coastal Navigation test. Now I'm using your radar book. Your books are what the full text of Shakespeare's Hamlet is to the old watered down classic comic books I used to read. Your wealth of detail is at first daunting, but then good navigation is in the details. For instance I have two other short radar books which I've read first as warmups. Yours make them look collegiate (and freshman at that). And the physicist of you shines through." "MT here, reporting in from Toledo with Great News! Today I was successful in passing the new 3rd Mate exams! I owe a large part of this to my use of your excellent programs, especially the Chart Trainer and the Nav Rules Trainer. These products made my studies very interesting and I was able to breeze thru a tremendous amount of information very rapidly. THANK YOU for your efforts on behalf of the maritime industry. Best regards." "The Navigation Rules online class was excellent. The lesson discussions were fantastic in reinforcing what I just read. Before taking this course I was mainly familiar with sailing rules and not much else. Now I have a good grasp on all the rules. I will continue to use starpath examiner and review the colregs to keep learning. Thank you for the great experience with the Navigation Rules class. The Coastal Navigation Course was excellent. The eCharts worked well, although I primarily used the paper chart. I have learned a tremendous amount of practical knowledge and can't wait to use it on the water. I plan to take more Courses." "Your text book is good. You start basic and build. You do as much teaching in your illustrations as you do in the text. They are easy to understand. You guys are professional navigators. ...I want to crew across the Atlantic and sail around Ireland. When my moment comes, I want to be ready. And I want to be smart. Thanks for helping me feel like it is not just a dream." "I really enjoyed the course and how much it taught me especially on how to be precise with my work. The feedback from the web site and the speed that the courses were answered and explained was very impressive. It opened up my mind to a new world out there and I now plan to start studying Astronomy in order to benefit even more from my celestial navigation. I will be purchasing some more goodies like the 2102 star finder and eventually the sight reduction books collection. I will be looking at doing some other courses with you in the near future and will gladly tell people I meet to do there course with you." "I would just like to say that this was a very interesting course as I am a launch captain in Trinidad. Although my runs are no more than 7 miles out of port this course has helped me a great deal by making me more knowledgeable on coastal navigation. i am also a more responsible person with the knowledge that I have gained.I will be participating in some of your other courses. In all the course is an extremely informative and a good starting point for anyone who may be thinking of a career in this field." "Starpath’s - Radar For Mariners - what a FANTASTIC course you have put together. Brilliantly executed. I absolutely enjoyed taking the radar course. The text book, Radar For Mariners, is written without fan-fair, it gets right to the point. This is a course you need to put your thinking cap on for, but it’s worth every minute of your time. The on-line version has to be one of the best programs in the business. The two radar simulators are as real as if you were out on the water. The “True View” element gave me a great understanding of what the boats are doing in comparison to what the radar screen was showing, a superb learning tool to say the least. All I can say is that, between the text book and the computer program and tutorials there is a tremendous amount of information here. Both David Burch and instructor Larry Brandt were very supportive and always available to answer my questions. The Marine Radar Student Discussion Forum is a highly effective and efficient way to handle questions. It’s a great resource for researching issues as questions arise. I highly recommend this course for both recreational and professional boaters and sailors alike. Even though I have finished the course I plan on going back and revisiting the radar simulator to keep up my skills. The various Demos are a great learning tool. In addition, as an ASA instructor, I will be using this program to teach my students the skills of radar navigation and collision avoidance. A proud salute to David, Larry and the entire staff at Starpath. I am looking forward, with great enthusiasm, to taking the Weather and Celestial Navigation course." "I have recently completed certification in your Celestial Navigation home study course. I had at times in the past purchased books on learning Celestial Navigation, but without much success. Your course however, is an easy, comprehensive, step by step approach to understanding and practicing Celestial Navigation, that I truly enjoyed studying." "Thanks for the good program (online weather course). I learned so much; I am amazed. Just the web sources made the effort worthwhile. This course contains excellent information. It is extremely helpful for cruise planning." "The Starpath Radar Class was an effective way to get both conceptual and hands-on experience using radar for navigation and collision avoidance. The material presented in the text and the classroom notes provides complete coverage of what turns out to be a complex topic - and the simulator provides real world application so the user gets comfortable with applying the material while underway. The course worked well for me and I will be safer on the water for it - many thanks." "I have been well prepared by taking your class. The course book and the supporting study materials were excellent and made it easy to understand and master the subject matter. I was especially impressed by the promptness and helpfulness of you and your staff. Every question was answered immediately and with attention to detail in the explanations. A refreshing deviation from the standard "customer service" encountered all too often nowadays. I can highly recommend your program to anybody who wants to venture into the subject of celestial navigation." "This class is very well thought out and the materials are excellent! For me there was just the right balance between clear, concise explanation on your part and requisite thought on my part." "This was the best on-line class I've ever taken and the book is so much more clear than the government text that was included as a reference. Great job! I will be looking into using some of your other class materials in my own teaching. Thanks." "I would feel negligent if I did not put my two cents in here. First of all, these are probably the best online courses I have ever taken in any discipline because of their well thought out and organized format and ease of navigation (no pun intended here). Secondly, I have always received prompt responses, in detail, to my questions no matter how trivial they might seem to other people. Thirdly, there is no pressure from the Starpath staff to complete the courses in a 5 to 6 week time frame. I have been working on both the Marine Weather and Inland & Coastal Navigation courses for almost 2 years now at my own pace. I am not taking these courses to receive a "grade" but to better my understanding and working knowledge of these subjects. In other words, you get out of these courses what effort you put into them. They are not simply a course you take one time and forget about. They are a resource that you can continue to reference 365 day per year, 24 hours per day. The reference materials and links to other resources are outstanding which is why I intend to keep my webcard up to date for years to come. Kudos to Starpath and their instructors for providing such a tremendous service to us. "I ordered your course a few years ago and found it to be an excellent course. I now have my oceans endorsement on my 1600 ton Master's and I still practice when I get the chance and average being within 1-3 miles of my GPS. My personal record is within 3 tenths of a mile from what my GPS had. I highly recommend your course to anybody that wants to learn and use celestial navigation." "I just got the results of my Nav Rules test from the CQAUX. I passed! Most people don't pass the first time that they take it. Your course was a BIG help to me. I especially liked the questions that you have at the end of each sections and suggested study areas for the questions that you miss. The best part I feel was the ability to practice real CG test questions and specify what exactly what you would like to test you self on." "I completed the home-study course a couple of months ago and practiced with my sextant as best I could here in Spokane. On January 19th, I headed for Tahiti, where I boarded the 134-foot brigantine Robert C. Seamans, for a two week cruise of the South Pacific. During the cruise, I took sights and did manual sight reductions, running fixes, etc. My fixes were consistently within 3 nautical miles of our GPS position. We didn't get lost. Thanks again for your terrific course. I enjoyed the course and even more, I was pleased with the real-world results at sea. Ahoy, avast and all that." "All in all a very enjoyable and educational course and great value. I also sent a recommendation out to my sailing friends about both the radar and the Nav Rules courses as well as the URL for the Starpath Website." "You guys are TOO COOL! Thank you very much for handling my dilemma so quickly. You're course is wonderful and I look forward to my relationship with your company. Thanks again." "Thank you very much for your truly outstanding course in celestial navigation, which I have just completed. The presentation was thoroughly professional in every way and, perhaps more importantly, lots of fun. Your complete command of the subject and your obvious joy in sharing your knowledge with your students was always evident in class. You have given me the tools I need to feel confident navigating far offshore without reliance on electronic devices. I look forward to increasing my skills through practice! I will recommend Starpath classes and products to my clients and friends without reservation. Thanks again!" "Thanks for the great support and service. I have since logged in, and have printed off the LAN test and am working on it now. I am almost finished the next chapter, Plotting and Charts. I enjoy the course, and your text is among the best I've seen." "Please allow me to express my appreciation for your school of navigation and your recently initiated on-line course on Celestial Navigation. I congratulate you on a fine course. In the year 01 I purchased your home study course on celestial navigation, but had problems finding the time and feedback to proceed. I welcomed the opportunity to participate as a student in the initial on-line course My interest in the study of celestial navigation derives from both curiosity and the hope of employing that practice in navigating a small boat across an ocean. The art of finding one's position on the planet from observations of celestial bodies is both wondrous and fascinating. I have recently completed the online course and found it to be outstanding. I feel as if I learned enough theory to begin to satisfy my intellectual curiosity (I appreciate the further opportunity to satisfy this curiosity provided on the Starpath website). I also feel as if I was given ample opportunity to practice examples of problems so that I feel that I am well on the way toward being competent to rely on celestial navigation to navigate a boat across an ocean (the additional practice that is needed is also readily available on the Starpath website). In short, I believe that the content of your online course is comprehensive and appropriately balanced between theory and application. The experience of taking the on line course was also outstanding. The staff at Starpath are very attentive, quick to respond to questions and problems, and very happy to help. The practice quizzes that were part of the course were comprehensive and instructive themselves. Equally helpful was the quick grading of said quizzes, and the comments in response to errors made. I was quite impressed with the ability (and willingness) of the staff to keep ahead of the students as they proceeded (at varying speeds, I expect) through the course materials. I also appreciate the opportunity I was given to practice the use of my sextant when I visited Seattle. I am especially grateful for the extra practice session provided me when my errors made in the first session were not explainable."